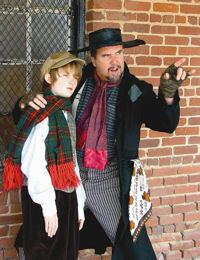 The Newnan Theatre Company has been entertaining audiences for over thirty years. Annually they produce 8-10 top quality shows for adults and children. They have an active year round teen youth group and the areas largest summer drama camp. The theatre is a 100% volunteer organization and welcomes new talent in the form of directors, actors, back stage volunteers, and audience members. Young or old, experienced or not, they encourage everyone with an interest to get involved! Located in an old warehouse on First Avenue in downtown Newnan, productions are scheduled throughout the year and usually rotate on a monthly basis. The Newnan Coweta Historical Society is charged with preserving our community’s rich heritage. The Historical Society maintains the Male Academy Museum, a former boy’s private school at 30 Temple Avenue, which contains multiple displays of our history, Indian artifacts, and Civil War weapons. The historical society also operates the historic Railroad Depot, 60 East Broad Street, and coordinates a yearly Spring Tour of Homes. Oak Hill Cemetery became the final resting place of soldiers who did not survive the Civil War. During 1863 and 1864, 268 confederate soldiers were buried at Oak Hill and a section of the Cemetery honors these soldiers. Due to the efficiency of the local hospitals, only two men are unknown. Every state in the confederacy is represented in these burials. Oak Hill also has graves of Revolutionary War soldiers and the two governors from Newnan, Ellis Arnall and William Atkinson. The Coweta County Parks and Recreation Department oversees countywide recreational facilities, recreational activities, and parks. Diverse activities include dancing, baseball, softball, soccer, tennis, pottery, karate, and yoga. 92 Farmer Street, Facebook page only The AAA is dedicated to the preservation and conservation of the cultural, historical, and architectural African-American heritage of Coweta County. In the heart of Newnan’s downtown commercial district, the Coweta County Courthouse is an excellent example of NeoGreek Revival architecture. The dome, which rises more than 100 feet, features clocks on all four sides. The bell in the tower announces each hour to the downtown area. The courthouse is the site of the trial of John Wallace, the first white man convicted and condemned to death in the South on the testimony of a black man. The murder trial was immortalized in the book, Murder In Coweta County, by Newnan Native Margaret Ann Barnes. The book was later made into a television movie starring Andy Griffith and Johnny Cash. Among other options, Newnan is home to a bowling alley, skating rink, and two movie theatres.